According to the U.S. Food and Drug Administration, tomatoes are low in fat and calories, and free of sodium and cholesterol. 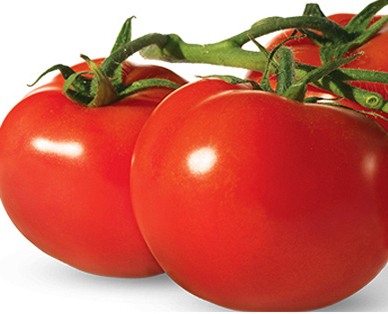 Tomatoes contain lycopene, which has been shown to help fight cancer. Cooked tomatoes have higher concentrations of lycopene. Be sure to keep tomatoes out of the refrigerator unless they are sliced. The refrigeration diminishes the tomato’s flavor. Tomatoes are also a good source of vitamin C, which can help boost the immune system’s ability to fight disease and cancer. Make tomatoes easier to peel by putting them in boiling water for about 30 seconds and then letting them cool. You can then remove the peels with a sharp knife. Or, if you don’t want to wait for the tomatoes to cool, you can plunge them into cool water for easy peeling. Pick tomatoes with bright, shiny skin and firm flesh.